Google built a multi-hundred-billion-dollar business by providing people with highest quality search experience and results possible. They continue to be intensely committed to excelling at delivering the best search experience possible. Take a minute to read these 13 snippets I pulled from their philosophy page. Since the beginning, we’ve focused on providing the best user experience possible. …a fast and seamless experience for millions of people. By shaving excess bits and bytes from our pages and increasing the efficiency of our serving environment, we’ve broken our own speed records many times over, so that the average response time on a search result is a fraction of a second. …designed to be fast enough for the modern web. …we continue to work on making it all go even faster. Ultimately, our constant dissatisfaction with the way things are becomes the driving force behind everything we do. Do these sound like guys that want to rank websites or web pages that are sluggish or provide subpar user experience? Have they been rewarded for providing the best search experience possible? Yep. If hundreds of billions count. What Would Happen If Website Owners Made Google’s Mission Their Own? I’m not talking about just making your site a little faster or responsive. I’m talking embracing Google’s commitment to “provide the best user experience possible”. Would you believe me if I told you that this commitment to improving user experience could increase your conversion rate 10 fold? But it is true. Let me tell you a short story. I in 2011 I began helping a client embrace Google’s commitment as their own. In 2011 the website generated .17 ¢ in website sales per unique visitor. Five years later the website generated $1.70 in website per unique visitor. That’s an average annual increase of 77% in dollars per visit. AND A TOTAL 10x INCREASE IN DOLLARS PER VISIT. Some of that 10 fold increase was improving what people saw (the design). Some of it was what they read (headings, calls to action etc.). But we found a huge part of it was what they couldn’t see or read. It was what they experienced. It was the ultra optimized WordPress theme. Google has been trying to get web developers to embrace their “focus on the user” for years. They’ve provided a resource called Google Developers. Where developers can learn how to improve the user experience. And more recently, have penalized slow non-mobile friendly sites while rewarding fast mobile friendly sites. Google’s also provided a tool that will quickly let web developers or website owners get insights on how they can improve the user experience of their websites. It’s called PageSpeed Insights. Some of the items the PageSpeed Insights tools audits have to do with your hosting and other items have to do with the content or images on your site, but many of the items have to do with the backend of your website. For WordPress sites – this is your WordPress theme. While the interface of PageSpeed Insights linked to above is easy on the eyes there’s another free (but quicker) way you should also consider using Google Chrome to audit your site and others. Because if Google is watching this data via Chrome and have given us access to see what they’re seeing – maybe they want us seeing it. Click ‘View’ from the menu bar. From the developer menu bar select ‘Network’. Refresh the page your on or visit any web page you’d like data for. Now move from ‘Network’ tab to ‘Audit’ tab in the developer window. Click run audit for speed suggestions. Bonus: Move from the ‘Audit’ tab and click the mobile/tablet icon and view your page as any device. There are thousands of WordPress themes. I’ve personally analyzed hundreds if not thousands. Unfortunately, the great majority are subpar. This includes (and usually especially) the really popular customizable themes that come loaded with shortcodes or drag and drop functionality. Which themes are best able to meet the above requirements? The Genesis Framework is very optimized out of the box. Quick Tip: Remember not all Genesis Child Themes are created equal. If you’re not building one from scratch, and not sure which ones to use – stick with the Genesis Child Themes built by StudioPress. In additions to have significant positive impact on conversion rates and engagement, Ultra-Optimized themes also have a significant positive impact on rankings and organic traffic. Let’s be honest. 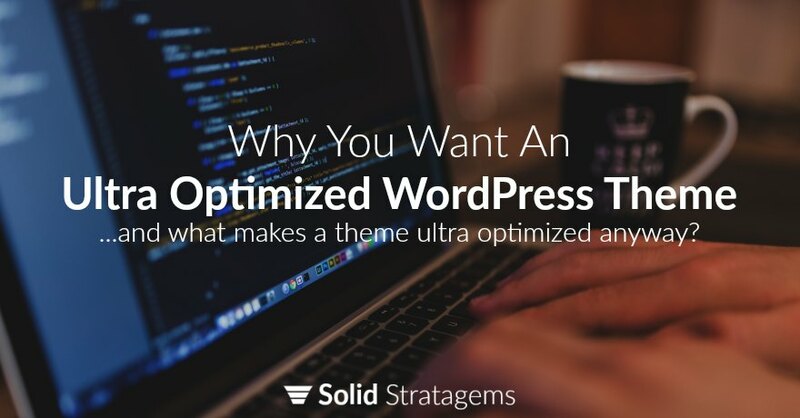 Most web WordPress themes are built with a “site owner first” or “developer first” mindset. Their nifty shortcodes and drag and drop functions are so convenient for the developer. It comes with a price. A price not worth paying. It’s something you’ve got to experience to really understand. Once you embrace the “user first” philosophy – you won’t go back. I'm a Husband, a Father, an inbound marketing enthusiast, and the founder of Solid Stratagems. I spent years trying to find the perfect inbound marketing company to hire for my first company (Alchemy Pest Control). I didn't find it, and decided to build the company I wished I could hire.